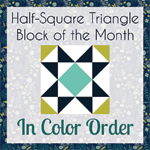 I have been working steadily on Orca Bay, but I decided to take a break and do something small – the blocks for my Block of the Month! I have been doing BOMs at this shop for 4? years now. I really enjoy it. I think the BOMs are what got me hooked on quilting anyway. It’s great because you have one small task each month and you actually feel like you accomplish something. As you can see, there are two colorways, but I can never pick which one I want to do so I usually end up doing both (or all three if the shop has three options). The blocks are designed by Marti Mitchell and they use her templates. I know that templates are a much debated topic in the quilting world, but I have to say that I definitely support them. It helps me with making sure that my shapes are cut the correct size and I don’t have to worry about constantly measuring everything. But the patterns also have directions for if you don’t have the templates, so they work for everyone.